It’s that time of the year again when the streets of Fremantle are bursting with the wonderful, the weird and the wacky – you guessed right, it’s the Fremantle International Streets Arts Festival! Over four days, from Good Friday to Easter Monday, you’ll find the best of the best buskers from across the world performing more than 100 shows around the city. From big pitches to roving performers popping up in surprising places all across the city, there’s a tonne of free laughs, shocking twists and awe-inspiring entertainment up for grabs. Here’s our top five not to be missed shows from the festival. We can’t wait to see you there! Prepare to be blown away by Cho Kairin ‘King of the Chinese Acrobats’ as he performs death-defying, extremely dangerous stunts including his truly amazing balancing act on top of a tower of chairs. Guaranteed to thrill and surprise! The Space Cowboy and The Lizardman test a string of experiments that push the mind, body and science to the limit. Warning: sparks, arrows and chainsaws will fly during this jaw-dropping performance. Get ready for Bug N’ Buzz to turn the Carriage Café at Esplanade Park into their very own playground! 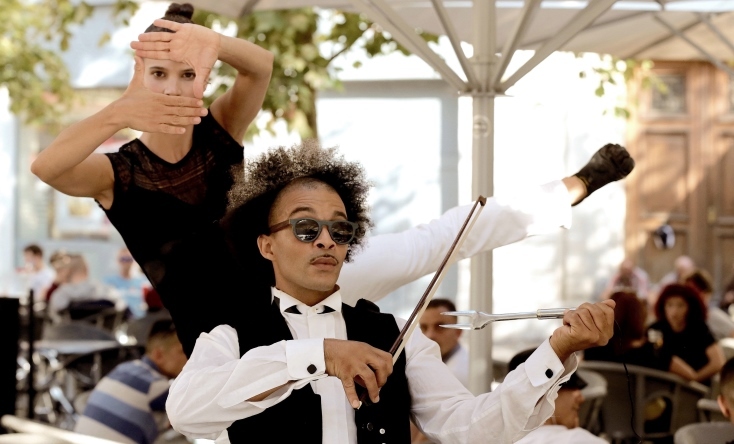 You’ll be mesmerised by Buzz transforming cutlery, glassware and tabletops into musical instruments, while Bug dances her way robotically in this infectious and innovative concordance. Witness French hair wizard Christophe Pavia use a few ribbons, flowers, birds, butterflies and a whole lot of whimsical skill to transform lucky audience members into a countess for a day. Truly enchanting! Watch Natural Wings take to the skies with their beautiful, intricate circus choreography, where they spin, twist, climb and twirl with humour, grace and strength. An incredible experience highlighted by the setting sun on Bathers Beach. To view performance times and locations, visit the Fremantle International Street Arts Festival website. Photo: Bug N’ Buzz. Photo copyright and courtesy of Philippe Hanula.